Throughout the decade when pop ruthlessly swept jazz aside, the Adderley brothers managed to stay in business with their distinctive “spirit of the south” – an optimistic, life-affirming style of modern jazz, bursting with colour yet steeped in the blues. 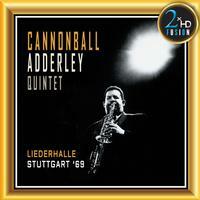 The Liederhalle concert was the highlight of the Cannonball Adderley Quintet’s 1969 European tour. From soul and blues (Sweet Emma, Oh Babe) to free-form contemporary (The Painted Desert) and lollypops cleverly combined with commercialism ((Work Song), the audience that night witnessed the sublime art of the quintet.